Our day began early on a beautiful sunny Saturday. 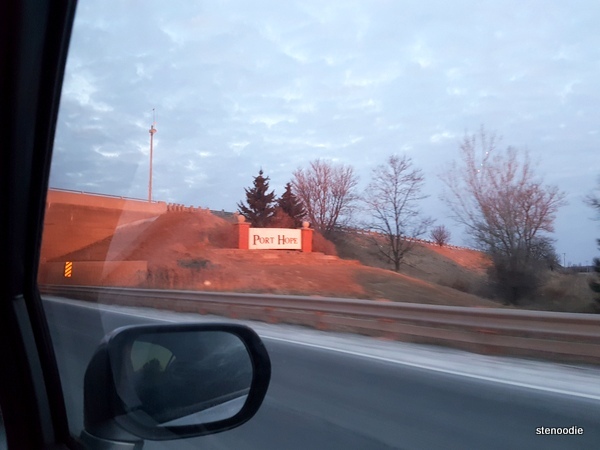 It took around an hour to drive east from Markham into Port Hope. 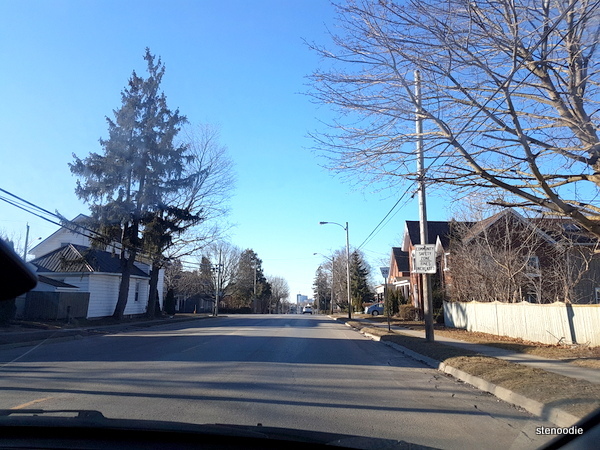 As we left at 8 a.m., the roads were clear and traffic was smooth. 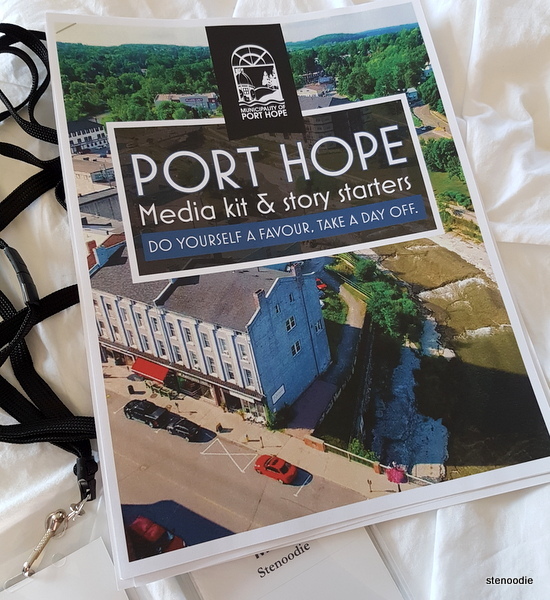 Our day’s itinerary was already organized and planned out in a detailed but flexible manner by the Municipality of Port Hope. We arrived at the hotel we would be staying in first to pick up our media kit and press badges. 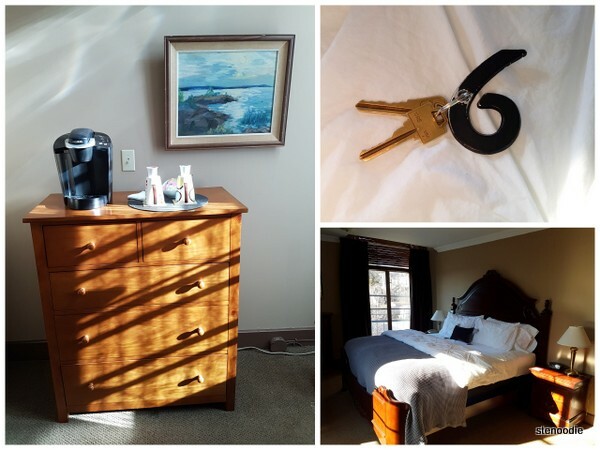 Half of us stayed at the Carlyle Hotel & Restaurant while the other half stayed at the Summerhill B&B. We were at the Carlyle. 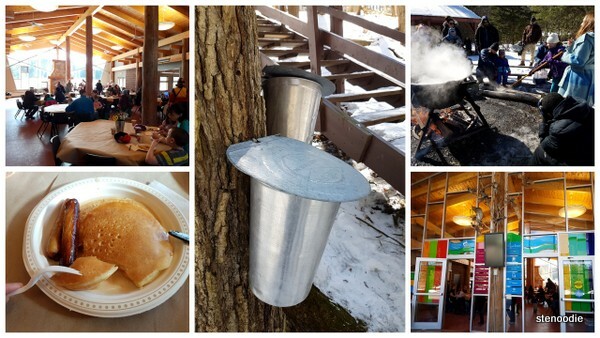 After we checked into the hotel, we set off to the Ganaraska Forest Centre for Maple Syrup Day! 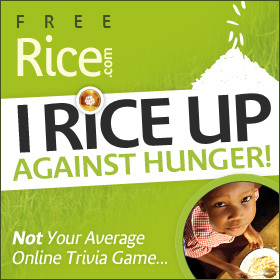 This was a perfect family friendly activity for the kids especially as it was the last weekend for March Break. 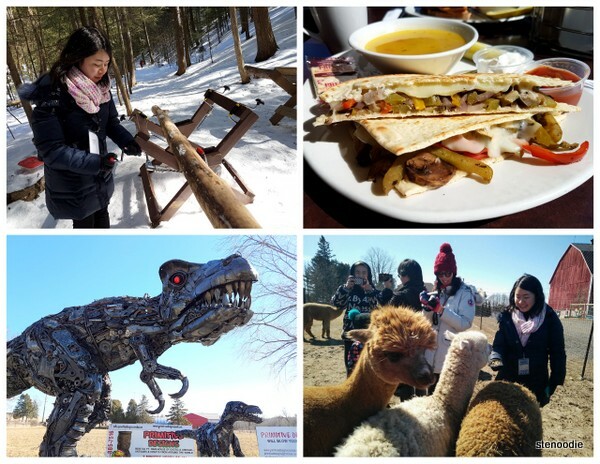 The Ganaraska Forest Centre was about a 30 minutes’ drive north of Downtown Port Hope. We enjoyed a hot pancake breakfast with maple syrup, sausages, and fruit with live music in the Great Hall. 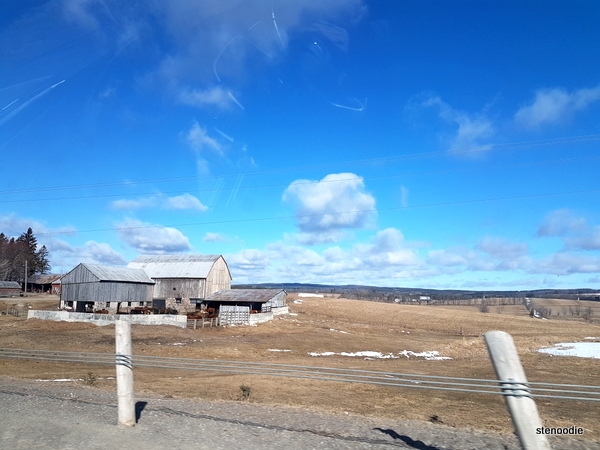 We then attend the Sugar Shack tour and saw how maple syrup was made traditionally for pioneers and also the modern way of doing it. View the blog post and all photos and videos here on this link. 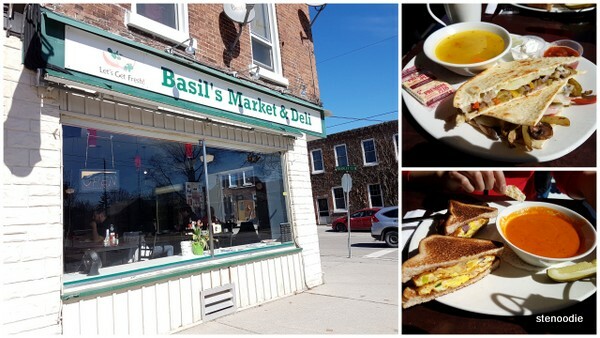 After a sweet morning outdoors, our next stop was Basil’s Market & Deli for lunch. 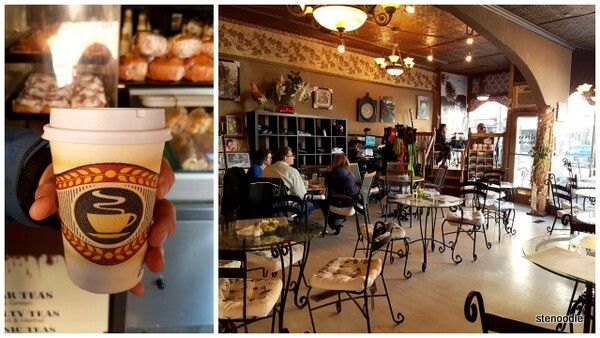 Basil’s Market & Deli is a local deli and quick stop restaurant for all your sandwich, soups, salads, pastas, coffees, and teas needs! We had a bright and sunny lunch here. 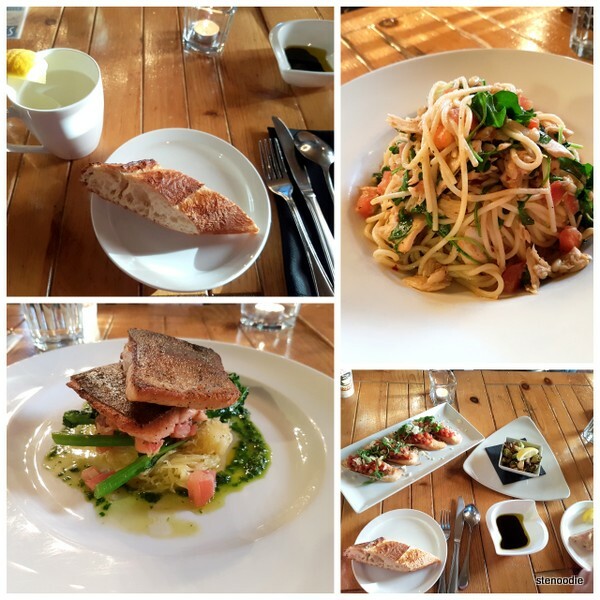 See what we ate for lunch in this blog post. After lunch, we were in for an amazing afternoon at a farm for alpacas, Nigerian dwarf goats, and Icelandic horses at Haute Goat! It was my first time participating in a goat walk and goat shmurgle and I had so much fun! We also got to pet and feed alpacas too (my second time :)). 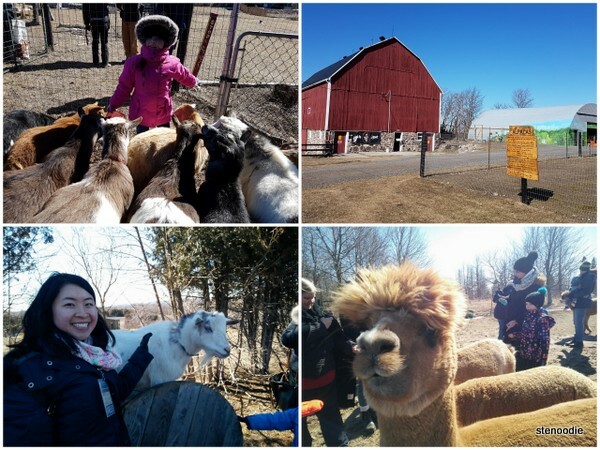 Haute Goat also has farm workshops where you can learn to make goat cheese, take part in goat yoga, and more! I took a lot of photos and videos and included them in this blog post that I wrote about the visit here. 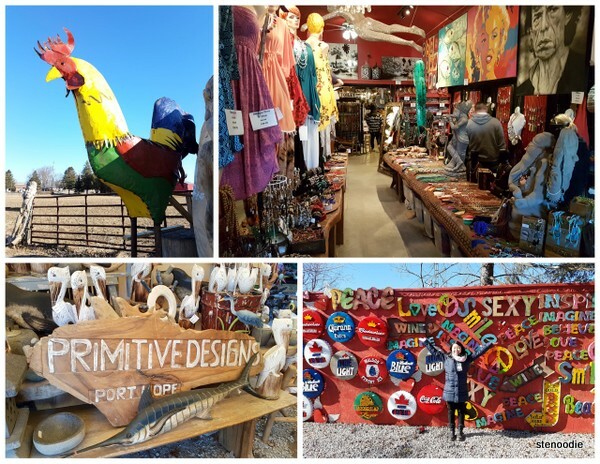 So much to see at Primitive Designs! 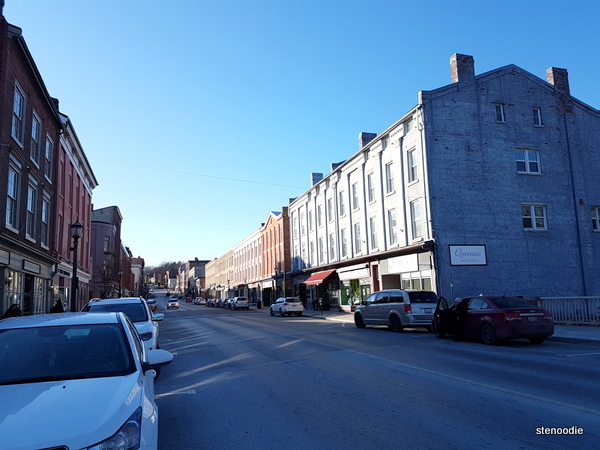 The sun was starting to set by this point and so we headed back to the hotel, parked the car in the lot, and went out on foot to explore a bit of downtown Port Hope. 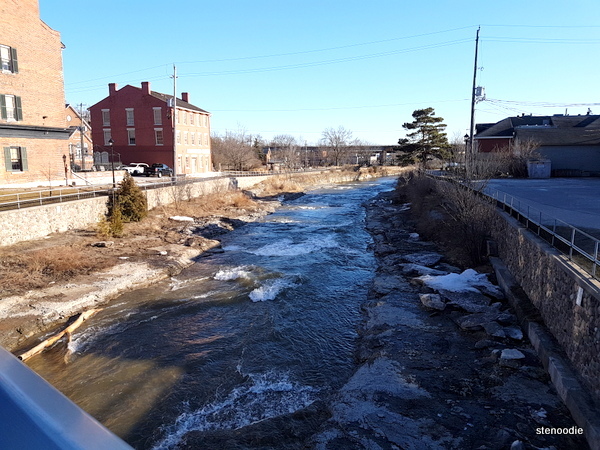 The downtown part of Port Hope is very walkable and scenic too with the Ganaraska River right by the streets. This was our second time exploring the downtown area and it was just as nice and peaceful as the first time we visited. 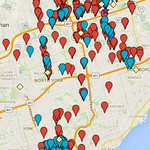 By 5 p.m., the majority of the stores had already closed. We went into Dreamers’ Cafe, a cute little cafe we had stopped into the last time we were here too. We also stopped inside Olympus Burger, a burger restaurant previously featured on “You Gotta Eat Here” and apparently where Canada’s best burger was. It was packed inside and even if we had wanted a table, it would have been at the bar. As much as I wanted to try this place out, it was getting close to dinner time and I didn’t want to ruin my appetite for it. Then since we were thinking of dinner, we decided to go to Trattoria Gusto earlier than the 6:45 p.m. booking time, which was a great idea. We were served and sat in the beautiful dining room as the sunlight streamed in. Our server that night was so attentive and nice. 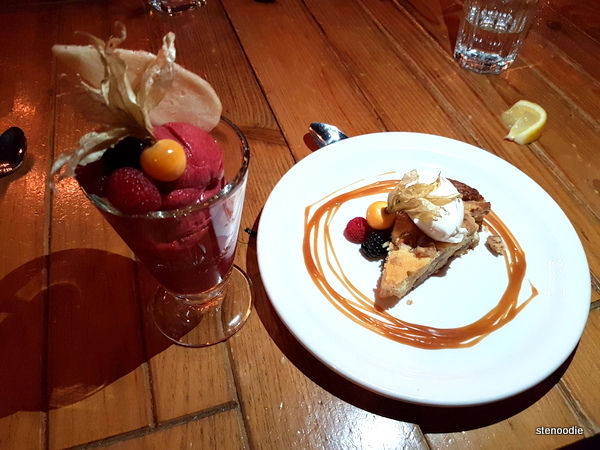 I really enjoyed our Italian dinner that night in the romantic and intimate dining room. If you want to ensure you get a dinner spot here, I recommend you make reservations. They have a large collection of wines too! You can see what we ate that night here in this blog post. 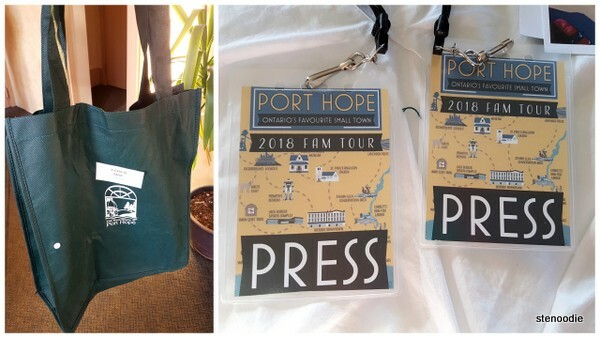 Thank you so much again to the Municipality of Port Hope and Port Hope Tourism for the opportunity to explore Port Hope and its hidden gems. From this weekend trip, I have grown to love this little town so much more. I love that despite it being an old town with lots of history and old buildings, a lot of care and attention clearly went into restoring and maintaining the area to make it very tourist friendly and fun for kids and adults alike. 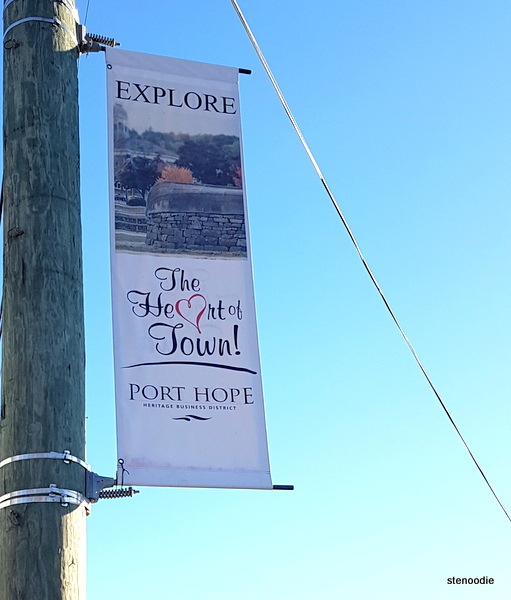 I never knew Port Hope was so likeable. I’m definitely looking forward to coming back next month for their annual Float your Fanny down the Ganny event. Hope you will mark your calendars and join me there too (April 14, 2018)! 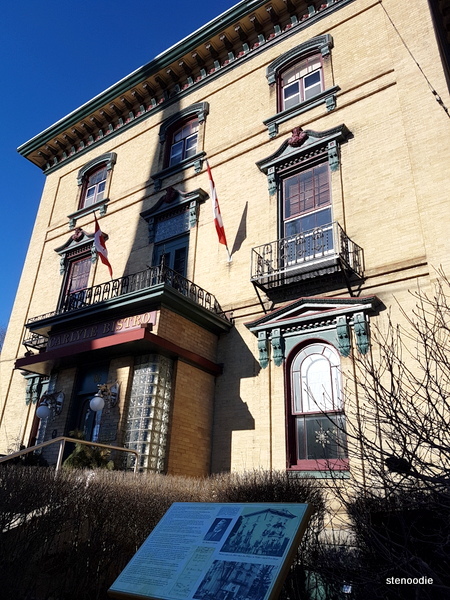 🙂 Visit www.visitporthope.ca for full details about this event and all other attractions in ‘Ontario’s favourite small town’! 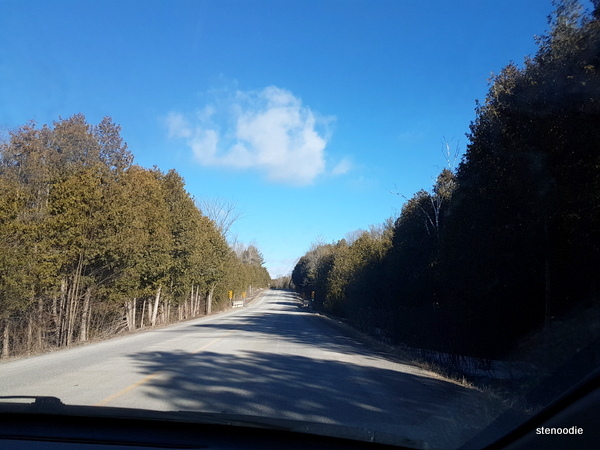 This entry was posted in Complimentary Adventures, Travel and tagged #OntariosFAVsmalltown, @VisitPortHope twitter, Basil's Market & Deli for lunch, downtown Port Hope, Dreamers Cafe, Dreamers' Cafe coffee, Float your Fanny down the Ganny, Float your Fanny down the Ganny Port Hope, Ganaraska Forest Centre, Ganaraska Forest Centre for Maple Syrup Day, Ganaraska River Port Hope, Haute Goat, Haute Goat farm animals, Italian meal at Trattoria Gusto, Maple Syrup Day Port Hope, Ontario small towns, Port Hope activities, Port Hope April events, Port Hope bloggers, Port Hope day trip, Port Hope Ontario, Port Hope restaurants, Port Hope things to do, Port Hope Tourism, Primitive Designs, things to do in Port Hope, things to eat in Port Hope, Trattoria Gusto, what to see in Port Hope. Bookmark the permalink.